The United Chamber of Commerce has passed a resolution in support of ALL six of the City Bond propositions on the November ballot. This endorsement comes after long discussions and work with the City, in addition to careful consideration of the pocketbooks of business owners and residents. 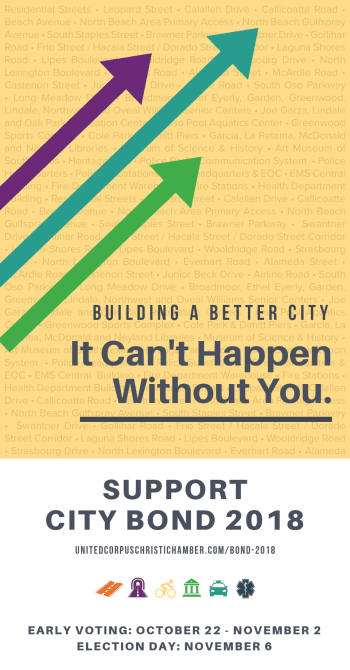 Our view is that improving our basic infrastructure – streets and certain primary city facilities – is vital to the economic development of our community. Poor infrastructure sends a bad message to potential investors and diminishes the value of our businesses and homes. Our work on these bond elections really began some years ago when we endorsed the 2016 bond ballot referendum and supported the concept of regular bond elections every two years to get us ahead, particularly on our street issues, Regular bond elections would create stability and continuity for contractors bidding on projects, increase competition to lower costs and normalize the work flow for the City’s engineering department. We have watched as the city has moved forward expeditiously with previously approved bond projects and the visible acceleration of street maintenance and spot repairs. All but a very few of the previously approved bond projects will be complete in 2019 weather permitting. These remaining projects were delayed due to external factors. For example, Morgan has been delayed pending completion of the Spohn Shoreline construction. A Chamber Committee, formed at the behest of Mayor McComb and led by Alan Wilson, looked closely at street issues focusing on residential streets. The proposed bonds (Proposition A) reflect part of this committee’s recommendations. The six city propositions total $96 million worth of projects in six categories: public improvements in streets; additional streets; parks and recreation improvements including senior centers and Cole Park; libraries and cultural facilities improvements including the Museum of Science & History and Art Museum of South Texas; public safety system and headquarters improvements; and public health facility improvements. Proposition A and B support street improvements. For a list of all street projects, click here. Prop A does not require a tax increase and includes over $52 million in street projects. Proposition B, which will require an increase of one cent, includes another $22 million in street projects. 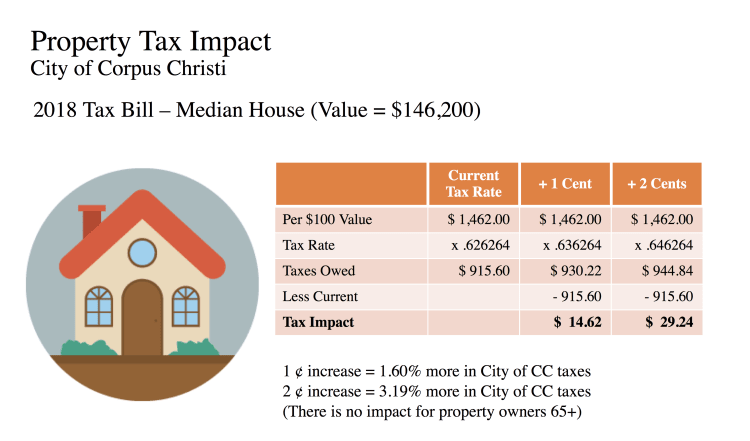 Propositions C, D, E and F, which focus on Parks & Recreation, Libraries and Cultural Facilities, Public Safety and Public Health respectively, each requires an increase in the City’s property tax rate for a total of another one cent. If all propositions are approved, property taxes will increase by 2 cents. For more information, click here. The City Council has also approved three other arterial street projects (portions of Everhart, Holly and Slough Road) that will be funded and begin in 2019 using the cash proceeds from the voter approved Type B Economic Development Sales approved by voters. 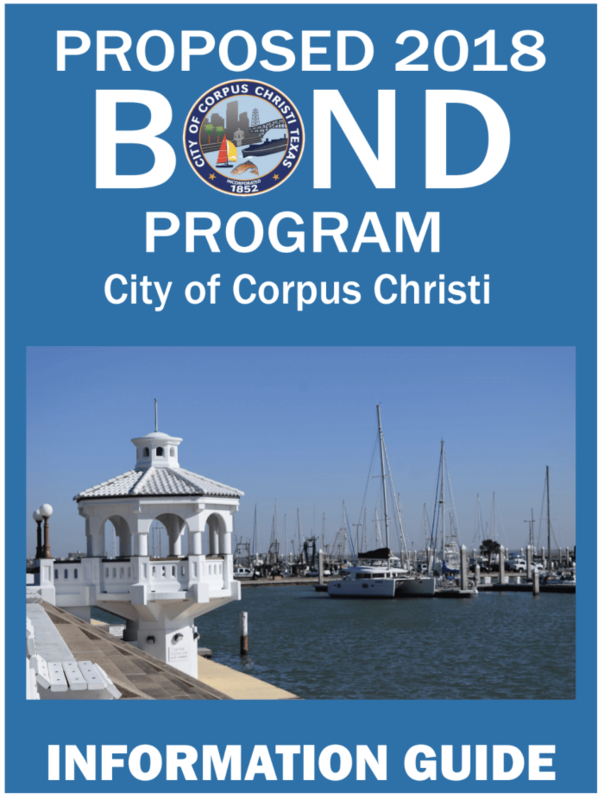 For an overview of City Bond 2018, and to review the full slate of propositions, click here!